François Trahan, Co-Head of Portfolio Strategy at Cornerstone Macro, and named #1 in portfolio strategy in 8 out of the last 10 years by Institutional Investors Magazine, recently sat down for an interview with Consuelo Mack on WealthTrack. Whether one agrees or disagrees with his perspective, it is important insight to include in one's evaluation of the market. Much of François' investment thesis centers around his belief that the economic cycle has peaked. He reviews a number of variables, but of his favorite indicators is the Purchasing Mangers Index and he believes the PMI in the U.S. has peaked. The PMI measure remains in expansion territory as it is above 50. However, in the PMI report for July, 9 out of the 11 categories that are measured declined or are slowing. 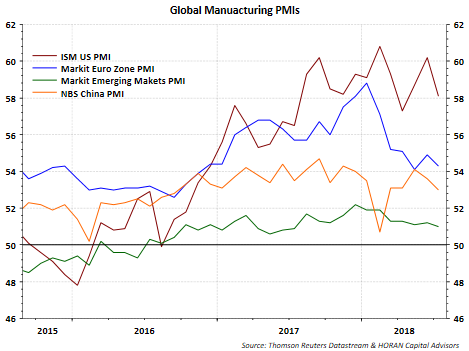 As the below chart shows, one could make the case that PMI's around the world may have peaked as well. At this point in the cycle, Trahan believes growth type companies is where investors should focus their efforts. As he notes this seems difficult given a nearly eleven year streak where growth has outperformed value stocks. He believes this is the result of a sub-par economic growth environment since the end of the financial crisis, resulting in growth type companies outperforming value. Historically, as he notes in the interview, until this cycle, the mantra was, "live in value and vacation in growth" and that has changed now. Where once value seemed a safe haven, he points to the fact the beta on value stocks is higher than the market today. So investors leaning towards value might be unpleasantly surprised in a market pullback. If nothing else, readers should gain additional perspective from the the entire interview that may be applicable to their portfolios at this point in the investment cycle.